In between herding cats and summertime activities, I've actually managed to fit in some sewing time! Some of it I can show you, some of it is Supreme sewing that will be revealed at a later date. Here is the next block from my Sweet Stitches BOM. It's called Sunny Days. I just love the Sunflower! Here is what I've had so far. You can see the blocks better if you click on the photo. I can't believe I'm up to date with all of them. This month's block came today and I'll get started on it right away. The other day Mr. Squash and I drove to a lake up in the mountains that we've been wanting to see. It's called Jubilee Lake. 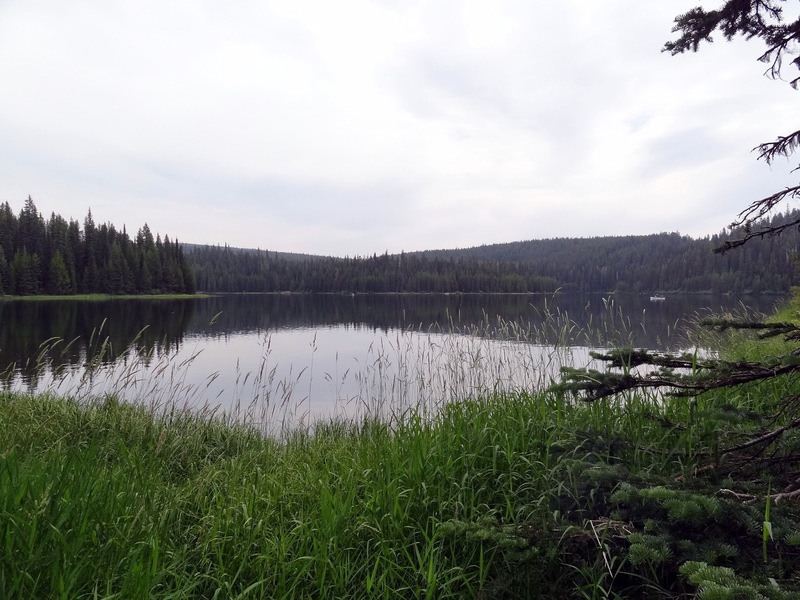 We took the paved road, but it can also be reached by driving up forest service roads from another side of town. Since riding in Mr. Squash's Jeep is tough on my back, we decided to take a picnic and go the easy way. It was somewhat cloudy, but also hazy from forest fires around the state. We found a nice picnic table and set up lunch, only to be joined by this little family of ducks! They must be really used to people as they got very close to us! This is just how close they were. The duck in front even reached out and tried to nibble my toe! One of the ducks had either a hurt or a deformed leg, so being the softies we are, we broke up an apple into tiny pieces and fed them all - trying to aim for the hurt duck so she wasn't left out! I have more sewing helpers than ever before now. Here is Gracie May lending a hand. She just fits on top of my machine! Pretty soon, though, I think she'll weigh more than the machine! Your blocks are beautiful. Is the sunflower painted? It's a happy flower. What a gorgeous place for a picnic with your friends. :o) Hmmm...does Gracie Mae stay there when you sew? I'll bet the girls could win the kitty Too Cute contest on Animal Planet! When we lived in the Eastern Sierras we used to take our grand daughter to the park in Bishop quite often. We very often brought our lunch to the park. Fed the ducks always. One day with Katie in her stroller we turned to see her little finger in a very hungry duck's bill. He was after her little animal cookie! Like those panels. Oh, my. Gracie as a quilter??? What a beautiful and peaceful lake. Love your blocks, and doesn't it feel good to be caught up? Boy, Gracie is such a good helper! That is so funny that she lays there. If Callie or Ozzie tried that, they would have just a bit of "fluff" hanging over the edges! Ducks can be pretty aggressive when it comes to food. Love seeing Gracie Mae on your sewing machine. She'll be too big for it soon. I'm not sure what is so fascinating to cats about sewing but my Sammie has to be nearby when I'm in the sewing room too. Of course, most of the time the pups follow me too! Sunny Days looks lovely. Your sunflower is adorable. 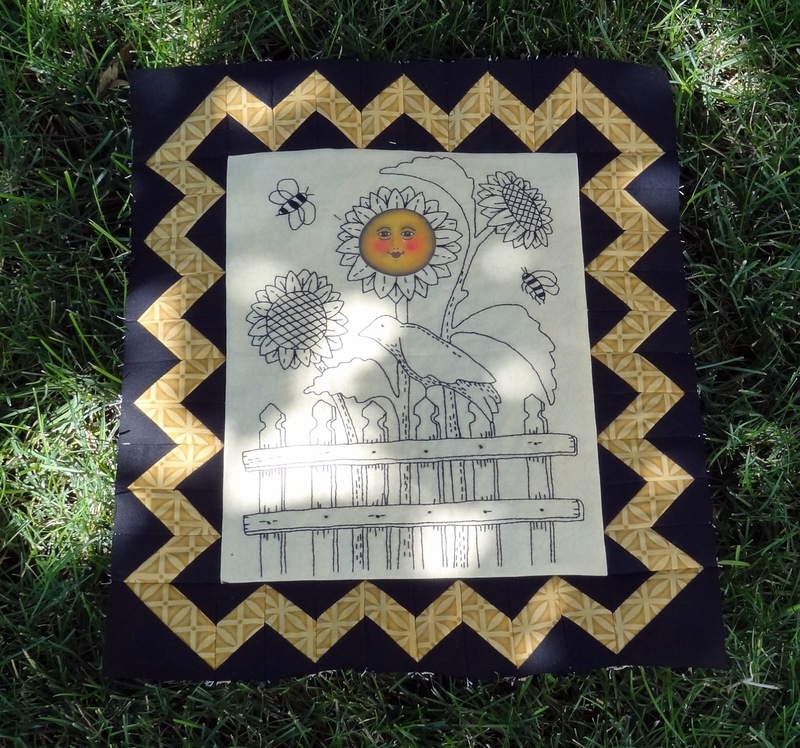 You are doing a great job keeping up with the blocks and I love the pieced borders! I can't believe how big Gracie is getting already. Nice to have so much help in the sewing room. Your blocks are gorgeous! 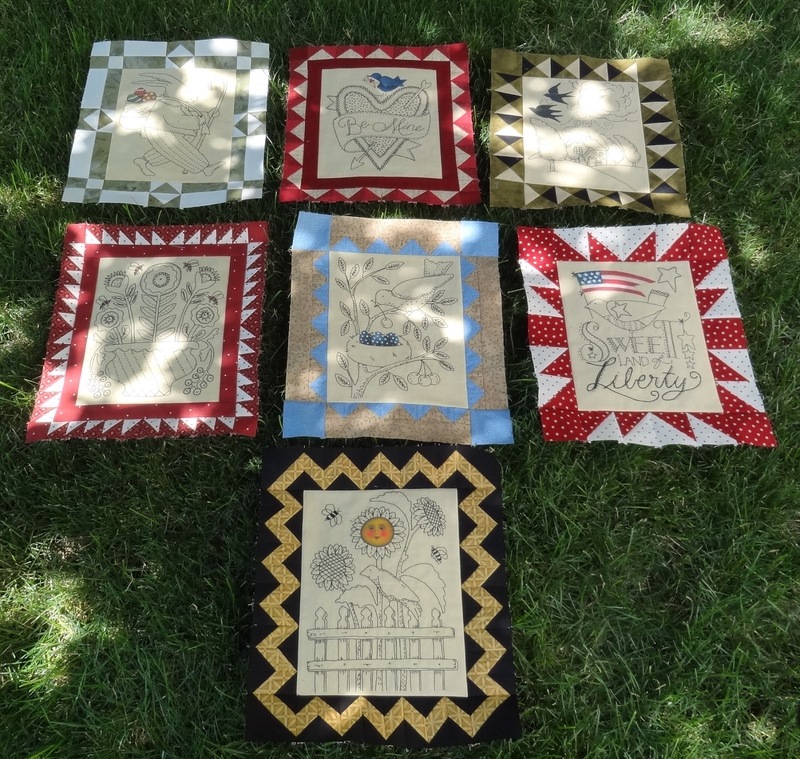 The patchwork borders are incredible and add a lovely sparkle! I can't get over how cute Gracie May looks on top of your sewing machine. I am also curious to know if she sits there while you sew :) What a lovely spot and cute company for your picnic! Your blocks are gorgeous! I googled the pattern and each one is so pretty...especially the Santa! Well done! 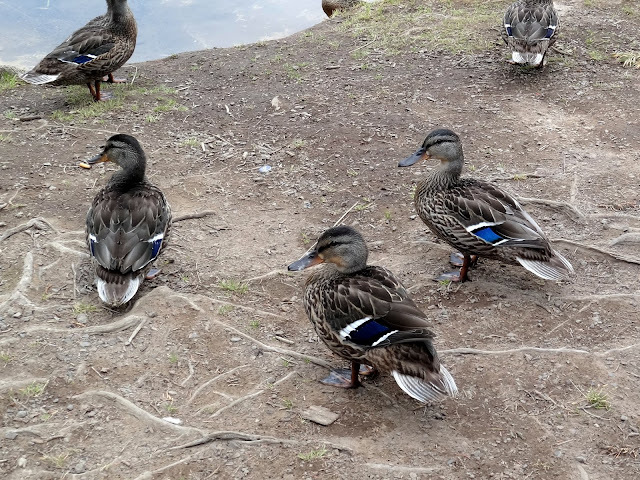 Beautiful pics of the ducks! Your stitcheries and the quilt frames are beautiful. Is the sun printed on the fabric or did you paint it? 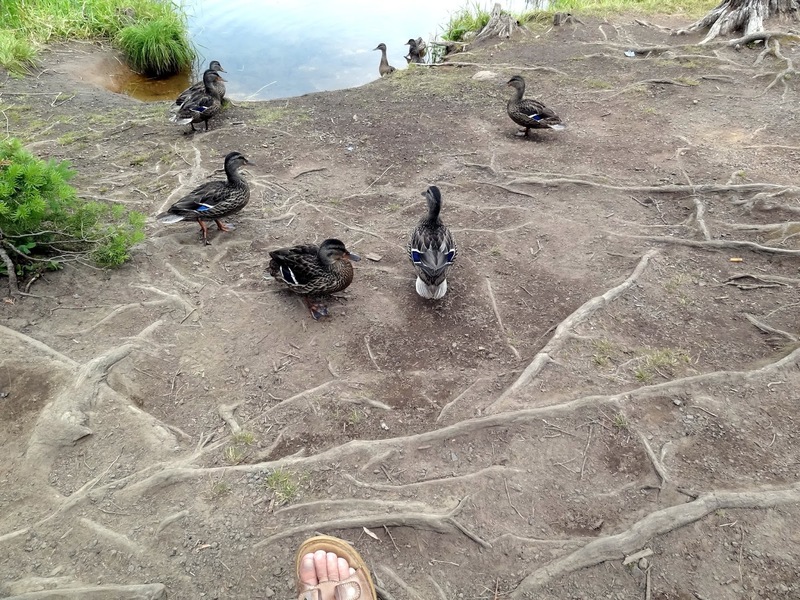 If there was a picnic table, the ducks must be used to coming there for food from friendly people. I envy your sewing machine table with the machine on the same level as the table top. Could be very useful for stitching big quilts. Lovely stitching :-) My son and I enjoyed the picture of Gracie May! Oh stop tempting me, Candace! Every time I see those blocks I want to order the BOM. They are soooo me! 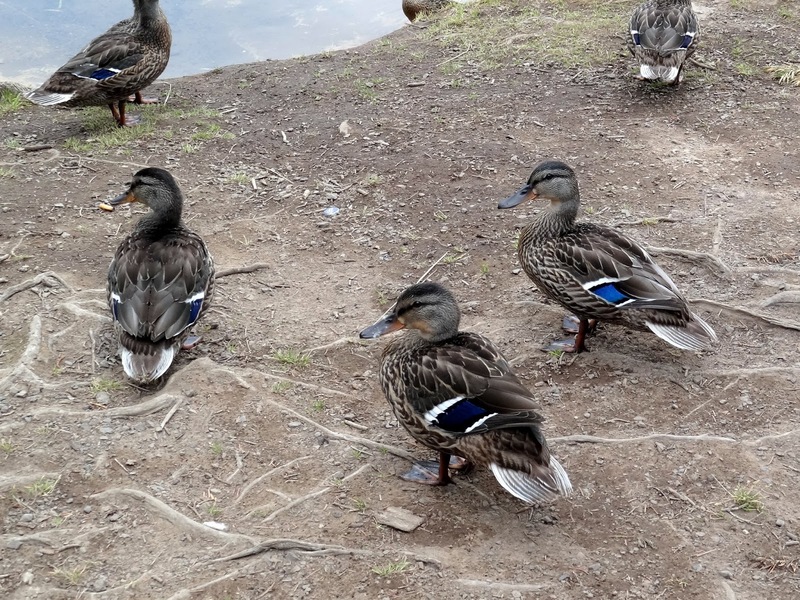 Aren't the mallards so pretty now that their colors are beginning to show on their feathers? Was Momma mallard around? I'm sure they were tame enough to be eating from your hands, literally. 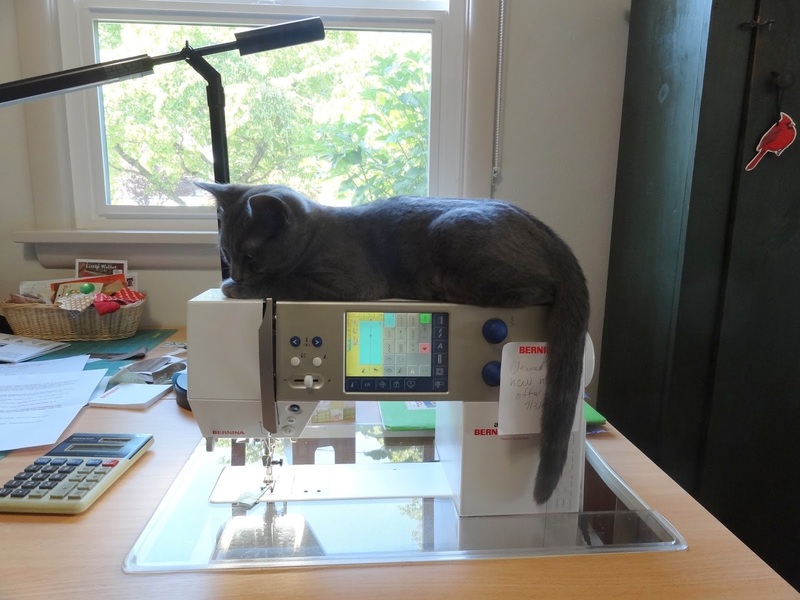 What beautiful scenery...and yes, I mean Gracie May on your Bernina too! WOW! that is so cool that you are keeping up with the blocks. I just got my squirrel one today.That is so funny to see Gracie Mae on your sewing machine. Maybe she likes the warmth from it. Cats get in the funniest places. I love your blocks. Where are they available? They look like something I would really enjoy doing. Wow - all the blocks are great. Isn't it a great feeling getting them done "early"? Does each block have a painted section in it?? Beautiful blocks. Love the ducks, they're beauties, too!